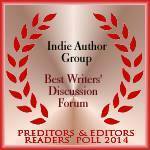 The Indie Author Group has won a Preditors and Editors award! We were voted BEST DISCUSSION FORUM, 2014! And while we’re here – would you like to join some new writer’s groups? On top of that we have a Triberr tribe, where we can all share our blogs. Or, if you’re hankering for genre discussion groups, we run a whole pile of them! Any groups marked with a star are closed groups – that is, people that aren’t members can’t see anything in the group until they join. If you advertise on any groups not set up to talk reviews, or other information, you WILL be removed. Pages marked with an (A) allow some form of advertising, either reviews or posts that fit the category or subject of the page. Next story Have your words checked. Previous story What’s in a press pack and why do I need one?